It has now become time to return the large crystal chandeliers which illuminate the gallery back into the painting. At an earlier stage, both of them have purposefully disappeared in the course of the painting process. 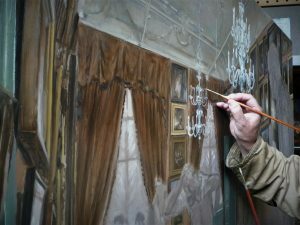 They were deliberately covered under some additive paint coats at the moment when the large curtains alongside the windows and some of the paintings on the right hand gallery wall had to be painted in. Because this way of painting requires that the background is always painted in first, before working one’s way to the elements in the foreground, it happens regularly that already painted parts in ‘doodverf’ (=dead coloring) stage have to be covered temporarily. This is specifically the case with such complicated baroque shaped forms as these chandeliers. 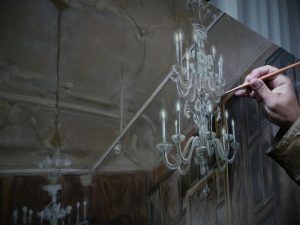 Because the under painting of these chandeliers was applied with sufficient ‘impasto’, it presents no problem now to relocate and replenish the original contours with the simple aid of a raking daylight. 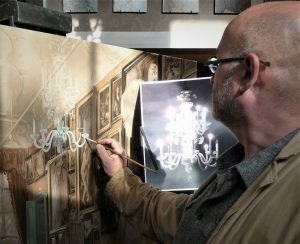 Also at this stage, painting the contours of both chandeliers is executed with rather lean blends containing mainly lead white oil paint. This is because of its rapid drying capacity, even when the paint has been applied rather pasty. 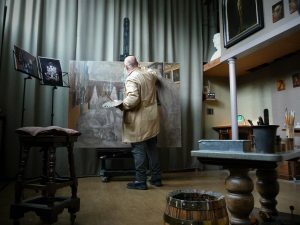 Only after a single night of drying time, the following day several oil glazes, using blends of yellow and brown ochre, raw green umber and lead-tin yellow, can be painted simply on top of it. Just as the brightness of a white piece of paper will illuminate a watercolor painting, the clear surface of the lead white under painting will function as a light source to radiate the different colors applied over it. The richly-shaped crystal with all its beautiful both transparent as well as reflecting facets is deliciously complicated to paint. Through its crystalline transparency, in which different aspects of the surroundings show up as seen through a magnifying glass, on the other hand the highly polished mirroring surfaces will be able to reflect other elements of the gallery as well. To reproduce this very complex interplay of transparency alongside and versus reflection, the character properties of oil paint must be used to recreate and imitate an impression of this crystallinity in oil paint. Not merely the opposite properties of crystal glass as material should be expressed when painting these chandeliers. They will remain numb without a strong light source to ignite them. 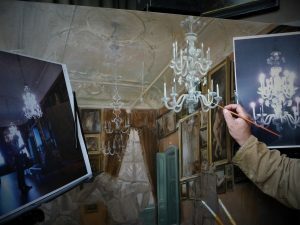 The large quantity of electric light bulbs in the chandeliers have to play their catalyst role, presenting the brightest source of light, not only in the gallery, but therefore also in the painting. Just like there is no day without a night, one can only paint light if there is sufficient darkness around it to serve as a contrast.